HSB now available on paperback!! I hope Joe does really well with the paperback...he kind of reminds me of my own son great young man and very creative. Thanks LK! It's the least I can do for such a great talent and all around great guy! I feel I'm also doing the customer a favor as well. One lady came in rather desperate for something to read...she'd read all the King and Koontz we had so naturally I offered up HSB! She was pretty grateful. I think we've all had that moment where we've read up all our favorite authors and are searching for someone new. And if there are any other booksellers, besides me and beagle out there, perhaps you could let us all know how HSB is doing in the trenches? 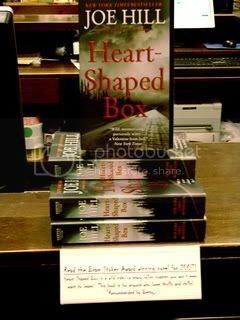 I noticed several paperbacks of Heart shaped box at local grocery store. betsy...that is so cool of you! beaglebiz - did i tell you "welcome" ?? if not...glad to see you and hope you stick around. Sorry guys...gonna toot my own horn again here! A lady came into the store yesterday looking for a new horror novel. She picked up the new David Sedaris book and asked me about it...because of the cover she thought it was a horror novel! (In case you haven't seen it, it has a rather creepy picture of a skeleton smoking a cigarette...I guess if I didn't know DS's work I might've gotten the same impression.) Well, I set her straight about DS...told her he was a real laugh riot and it would definitely be worth buying, but if she was looking for a really great horror novel she should give HSB a try. I gave her a little bit of the plot and she was so intrigued she bought it! I love it when that happens. Talking to other book lovers is going to be the part I miss most about that job. I missed that display, Betsy. Very, very nice. Barry Wood wrote: I missed that display, Betsy. Very, very nice. Thanks Barry...let me know when you get your first novel published. If I get another job in a bookstore I'll do the same for you! Thanks, Betsy. What I like most about the display is the handwritten recommendation. I think it's cool. 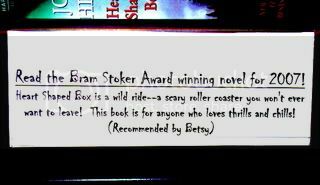 Barry Wood wrote: Thanks, Betsy. What I like most about the display is the handwritten recommendation. I think it's cool. That's sweet of you to say, B, but I cannot tell a lie. I used the computer to make that little sign. I found a sorta creepy looking font to use. I wish my handwriting was that good!